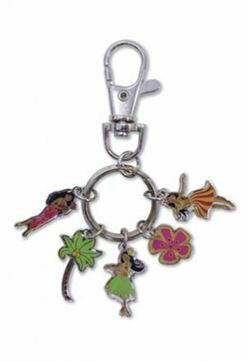 This adorable Island Hula Honeys Charms keychain features five icons representing the lifestyle and beauty of the Hawaii. This keychain makes a useful Hawaiian gift for family and friends or a perfect keepsake for yourself. Icons average approximately 1/2" x 1/2". Key chain measures 3-1/2" x 1-1/2". Red Medium Hibiscus Hair Clip 3.5"
expected charms to be a little larger.